Realis Popper 64 is strictly about business. It fires accurately and arrives to its destination effortlessly. Just pick your target and catch your fish. It’s the ‘run-n-gun’, making pattern fishing easy. It’s been said by some, you can’t improve on the popper too much. We at DUO beg to differ. While other companies spend their enthusiasm on the “skin” of the bait, DUO focuses on the internals. As we know, unfortunate impacts with seawalls and rocky shorelines will occur. It can wreak havoc on poppers, but the 64 was designed to meet this challenge. The wall-thickness of the Popper 64 and its internal bulkheads provide structural rigidity and durability. The “pop” in Realis’ topwater bait displaces more water with less rod action due to a thin angled rim –deflector. This means no more filing a lip to get it to grab more water. The multi-angled cup also aids in helping the lure walk the dog. Yes this popper actually walks the dog very smoothly. Stop it and pop it abruptly and it will push a significant amount of water. As simple as some poppers are, DUO decided on a more intricate design. R&D staff spent countless hours on perfecting the action and static pitch of the lure. Many tournament poppers lie near flat or sit at approximately 30 to 40-degree angles, freeing the hooks and extending the profile. DUO went the other direction. The Popper 64 rests near vertical, giving it a more streamlined silhouette and there is no loss in hook up ratios. Wave action doesn’t hamper its ride or position and more of the body is submerged, exposing more lure to the fish. 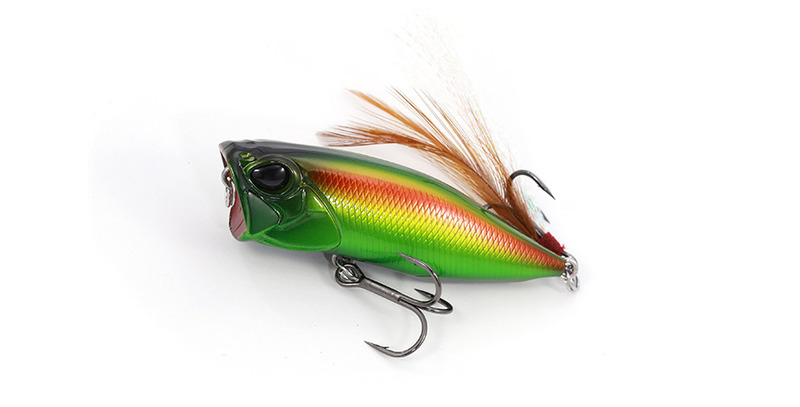 Examine the rear of most poppers and you will notice the end of the lure looks like the designer just stopped. Realis Popper 64s tail region is tapered aggressively. It possesses a sharp keel that flattens at the base. This aids in “walking the dog”. The area around the hook anchor is shaved back, providing more freedom to the rear hook. The sound chambers are more advanced than other JDM poppers. Sound can be generated equally and multi-directionally; unlike many top water baits which are dependent upon specific direction to maximize the acoustics. You will be able to easily perform the side to side “dog walking” action with its shallow cup design. Further, the water gripping rolling action that can be performed in short reeling distance will help you appeal at your pinpoint location. The more than sufficient body volume has realized great casting distance and accuracy. With the lures castability, anglers will be able to search a vast area in various field conditions irrespective of tackle or anglers casting skills. We have tied a feather hook in combination with tinsels for the rear hook. 3 colors, yellow, brown and white are available depending on the body color.